The American Independence Day is not far off and its time to gear up and plan for the party! This Fourth of July, get the BBQ lined up and celebrate it with your family and friends. Here are a few list of suggestions and party ideas for you to enjoy your vacation to the fullest. Gear up for a patriotic picnic with family,friends and relatives. Be it your front-lawn or some other place,picnic is always a fun-thing for both kids and adults. For a fun-filled picnic, get the sandwiches ordered the day before and wrap them in red and blue papers.Roll the blue berries and straw berries into a cone using a white sheet. That makes up to the party theme on the table.Decorating tables with red,blue and white striped cloths and plates; along with the mouth-watering grilled meat fancify the party.Conduct games for kids and adults to keep the buzz on. Picnic during such occasions with family and friends forms a positive aura and spreads happiness and patriotism. 2. Invite family and friends for dinner. Conduct a re-union by inviting your family and close friends for dinner and enjoy the Independence Day with your close circles. Decorating your home with paper ribbons and small flags, personalized items like dishware, coffee mugs,door mats,aprons betters the party mood. 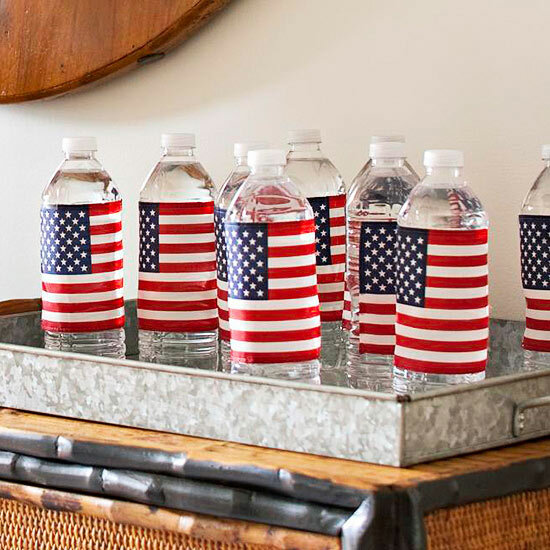 You can also wrap small paper flags to the water bottles to get the spirit up. Its almost certain that the after-math of the party or picnic will be filled up with a lot of dishes to do or maybe even disposing plastic plates. Instead, you can get the bio-degradable party kit which has all the utensils and plates. 4. Relish the joy with foods! If you are away from home and wondering how to celebrate the Independence Day within your budget and be hunky-dory about it; well, you always have an option of going to barbecue restaurants or malls and enjoying the native american food tastes. And during the evening you can watch the fire-crackers show or take someone to a concert. Happy Fourth of July 2013! !